Assapora un assaggio di Santa Fe ed esplora a piedi il Railyard Arts District, in questo tour guidato a piedi. Segui la tua guida locale attraverso il quartiere, imparando come l'arrivo della ferrovia ha aiutato Santa Fe a evolversi. Fermati in quattro ristoranti e stabilimenti per assaggiare cibo locale e bevande (incluse). We had a very enjoyable afternoon trying great food and beverages! We went back to several of these places again during our stay. What a great, fun, friendly, relaxed food and walking tour! Jackie was delightful, and took us to some off-the-beaten path places in the Railyard district. We learned a lot, drank, and ate great food. Don't eat much before the tour, and get ready to enjoy beer, wine, margarita, and spirits. This tour was truly an unexpected delight. We were treated like VIPs by owners of really special establishments who took their personal time to explain the history of their place, or how dishes were made, or how a tiny change in the distillation process changes your favorite whiskey. Samples included. Joe is a great tour guide and he conceived and created this tour so he's very much a part of it. Don't miss it. This was okay. I thought it was a bit pricey all things considered. I know that some people consider alcohol an important part of a food tour. However, I'm more interested in the food aspect. : That may just be me. One stop is all alcohol, so I was a little disappointed in that stop. Our guide was very good. She was quite knowledgeable about the area, and the variety was good. What a great way to experience Santa Fe! Joe, our tour guide, definitely loves his town and enjoyed showing us some of his favorite restaurants. Getting to meet the owners at each stop, who genuinely appeared to enjoy sharing stories about their establishments and/or how they came to serve what's on their menus, made this a particularly unique and enjoyable tour. The small group made it feel like you were sharing meals with new friends. A great tour! Our tour guide was very knowledgeable. We enjoyed 3 delicious food samples along with an alcohol pairings plus a liquor tasting. The food samples were substantial. We enjoyed meeting owner or chef of each establishment. I would recommend this tour. This is a great tour for both food and history. Joe is an awesome tour guide and we learned new things about Santa Fe, even though we have been coming since the 1980s. Food was first rate, the drinks beer and wine on our tour were good and the people at each place were very warm and welcoming. Would go with this company again in a heartbeat. Highly rated, and we have been on a number of food tours in other cities, this was one of the best. 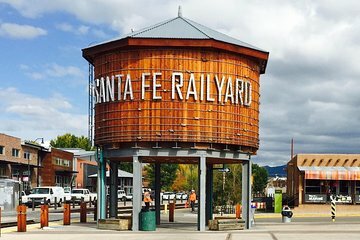 This was an awesome tour and Joe from Wander New Mexico did an excellent job showing us around the modern rail yard / historic depot area of Santa Fe. It truly was off the beaten path, introducing us to some excellent food and beverage establishments we never would have known to try on our own. The walking is easy, scenic, and Joe is very knowledgeable about the local history. We met the owners of the restaurants and they, along with Joe, gave us very personal service, and they all went out of their way to welcome us to Santa Fe. The food and beverage choices were exceptional. All in all, a great experience and one of the best walking tours we've ever been on. The guide was excellent, very well informed, terrific tour with some great spots for food and drink. Highly recommended.